Today, we will talk about Korean Kimchi. 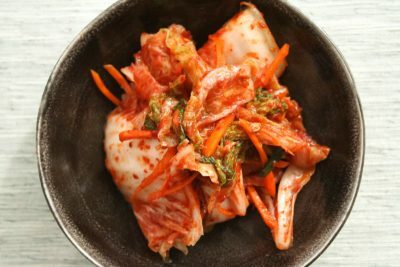 Kimchi is considered to be Korean staple food, a traditional side dish made from fermented Napa cabbage / Chinese cabbage as its main ingredients. It has a variety of seasoning and other vegetables inside. There are many kinds of Kimchi made with different vegetables as the main ingredients. I’m not Korean, but to me having Kimchi in my fridge is giving me a sense of security. I have been longing to eat Kimchi for a long time since I moved to Cyprus, and I never get enough chance to eat it while in Indonesia. In Cyprus, it’s not easy to find Korean grocery or Napa cabbage itself here in Cyprus, that is why my version of Kimchi is less in the ingredients. I can’t find radish, it is very difficult to get Chinese chives, and almost impossible to find fermented shrimp, which has to be added in order to release different taste sensation. Few months ago, I started to go to Chinese supermarket close to my office, and I finally found basic ingredients to make Kimchi. To me, now it’s very soothing to know the fact that I can make Kimchi by myself here, even though it takes 4 hours minimum just to prepare it. I love the fact that it is probiotic food and super healthy because basically all ingredients are raw and using a simple and natural way to ferment the vegetables. My homemade Kimchi has been approved by my Korean friend, yay!